Care Tips for your Tiny Forest Terrariums! Our Terrarium with 3 plants with basic decor, RM60. Email us at tinyforestsj@gmail.com to purchase! There’s nothing more satisfying than bringing home your very own Tiny Forest terrarium. But what’s next? We have all the care tips and guidelines to keep your plants alive and healthy for as long as you can. 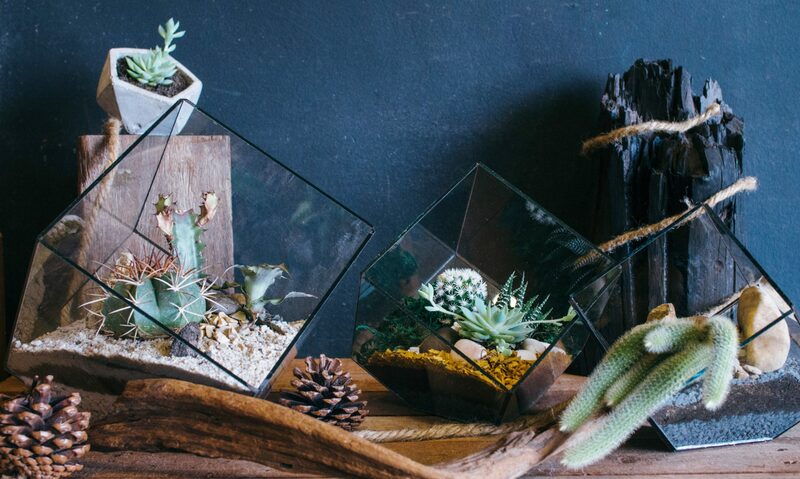 The kind of terrariums we sell are open terrariums, meaning its easier to take care of! 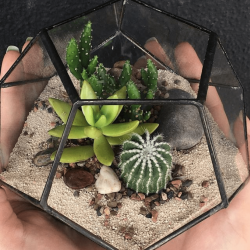 These terrariums have open vessels allowing air circulation, your cactus and succulents love this. If you got succulents in your terrariums, its essential to know more about them. Succulents are typically comfortable not receiving too much water, and don’t need much root space to thrive, making them perfect for small enclosures. Plus, many species stay small and compact, allowing them to live for years in a terrarium without transplanting. Succulents and cacti love the sunlight- as long as they are not directly under them. Keep your terrarium in a bright room, but away from the window as direct sunlight can burn the plants. Some may suggest that succulents and cacti don’t like water, which is not true. These plants LOVE water, but only a little bit enough to keep the soil moist. As long as it is warm enough and they are getting plenty of light, they will benefit from a good soaking. In a terrarium without drain holes it is important to water the plants sparingly around the base of each plant using a watering can or a spray bottle. The soil should be allowed to dry between watering and there should not be any “sitting” water at the bottom of the pot. Overwatering is one of the fastest ways to kill your plants. When your plants get too much water, the bottom leaves start to die or rot. Basically, water your plants when you can feel that the soil is dry. Should you find your plants already dead (because you just realized that your terrarium had been out of your peripheral for 2 weeks), pick them out and get rid of all the rotting roots or leaves from your terrarium as this can affect other plants, causing them to rot as well. Sometimes you’ll notice that your plants are looking a little flimsy, this mean they need some plant food. You can visit you nearest nursery, and get the best plant food for cactus or succulents, make sure the it is mild towards the roots and the plants. Do not overwater your plants, but make sure they get enough water. Get rid off dead leaves as they can affect other plants from rotting. Thanks for reading our blog! Till next time, happy terrarium gardening! Previous PostPrevious Tiny Forest is now on Kidxy! Next PostNext APRIL 1st : TINY FOREST POP-UP MARKET!